30 Years A Black Belt! I've just realised that next year is the 30th anniversary of my grading to black belt. I took my 1st dan grading in 1989, and my belt was awarded by my former teacher, Sensei David Currie. Where did the time go...? Meanwhile, here's a video of Koichi Tohei, sadly no longer with us. Other than my own teacher, Tohei has been the greatest single influence on my own aikido. The study of weapons in some styles of aikido is almost ignored. In fact, weapons are at the heart of aikido. Working with the bokken (sword) and jo (staff) teaches you balance, correct distance, dynamic movement, whole-body movement and it helps to build in many other important qualities such as being centred, fluidity, blending and much more. Of all the 'schools' of aikido, it is perhaps the Iwama style, based on the teachings of Saito Sensei, that is best known for its strong emphasis on weapons training. Iwama aikido has a very large weapons training syllabus with katas, jo-taking, jo-throwing, paired bokken exercises and much more. Ki Aikido, based on the teachings of Tohei Sensei, also has katas and other exercises though in my experience, Ki aikido practitioners usually devote much less study to weapons than Iwama students. Even so, the Ki style has much to offer. Its katas tend to be more dynamic and 'flowing' than those of the Iwama tradition. In fact, however, the two style overlap considerably - hardly surprising since both Tohei and Saito were long-term, high-grade students of The Founder. Remarkably few students of aikido have experience of both the Tohei and Saito style of weapons practice. Which is a great pity. If you study both you will soon appreciate how well they complement one another and how much you can learn from both traditions. Well, here in North Devon, you have the rather unusual opportunity to study both styles. The Sensei of the Hartland Club, Huw Collingbourne, has studied in the Ki tradition since 1983. For the last six years he has also studied Iwama weapons with Sensei Richard Small of Bideford Aiki-jo. And recently Sensei Small has been studying the Tohei-style katas to add to his extensive knowledge of Iwama weapons practice (which he has studied and taught since the 1970s). Both Sensei Richard and Sensei Huw welcome practitioners of all styles of aikido. If you have studied Iwama style, Ki style or a style with its own weapons syllabus or no weapons syllabus at all, we hope you may find something of interest in the sorts of aiki weapons that we both teach. Why is this? When I began aikido, in the early ‘80s, it was a fast-growing martial art. How has it entered such a sharp decline over such a short period? George Ledyard Sensei (7th dan) argues that “MMA, or mixed martial arts, dominates the martial arts scene. Brazilian jiu-jitsu is its tamer and healthier cousin. Young men these days do not seem interested in the more traditional martial arts. They want to fight. And, of course, it is impossible for any of us to compete with the fact that MMA is shown on prime-time cable seven days a week.” (See: ‘Aikido: An Aging Art and its Future’). Another Chinese Martial Art site used Google Trends to try to determine public interest in various arts over the last decade or so. “Judo saw massive declines in popularity in the 1980s, and apparently that trend continues into the present decade. Aikido showed perhaps the most dramatic declines in searches,” and “there has been a marked decline in the number of people searching for information about Tae Kwon Do on the internet over the last decade. 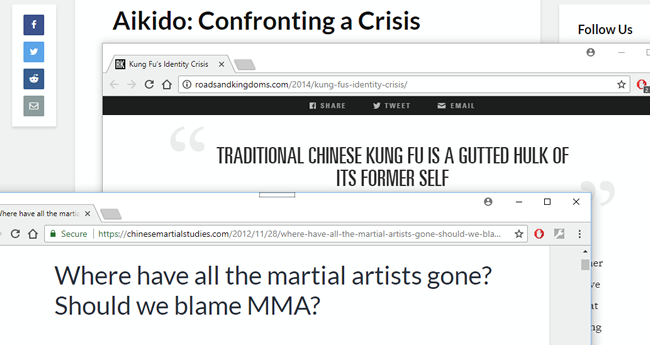 My feeling is that the rise in public exposure to MMA is particularly bad for Aikido. MMA is competitive. Aikido has no competitions. MMA fighters use strength and aggression. In Aikido we deliberately avoid using strength and emphasise calmness at all times. MMA goes on the attack. Aikido is defensive only. In MMA winning is the end goal. In Aikido, the quality and elegance of technique are valued above the ‘mere’ defeating of an opponent. It is not easy to explain this to someone whose only exposure to martials arts comes from MMA! Can aikido (and other traditional martial arts) recover from this decline? In the short term, I think probably not. In the long term, yes, I believe absolutely they can and will. Why? Because they have a power, logic, elegance and philosophy which has not only stood the test of time but which continues to fascinate and intrigue generation after generation of people. But, for the time being, we simply have to acknowledge that aikido is unfashionable. We can only hope that something will arise to help explain to the general public, the philosophical underpinnings of the traditional arts. Not everyone wants to fight competitively. The problem with the popularity of MMA is two-fold for aikido. 1) Those people who want to fight don’t appreciate aikido as a non-competitive, non-violent art, and 2) Those people who don’t want to fight think that aikido, being a ‘martial art’ must be aggressive and violent. Once upon a time, the seeming paradox of a martial art that is peaceful was the thing that most attracted students. It can still attract students. We just have to work harder at getting the message across to them. How we do that, however, is a problem to which I don’t have an answer. The Physics of a Punch!